Mount Prospect Road motorcycle crash scene on curve north of Touhy Avenue in Des Plaines Friday evening. Des Plaines resident Miguel A. Alfaro, 40, died in an apparent one-vehicle motorcycle crash shortly just before 4:14 p.m. Friday August 11, 2017 in the northbound lanes of Mount Prospect Road just south of Touhy Court. Des Plaines police and firefighter/paramedics responded about 4:14 PM Friday August 11, 2017 to a report of a serious motorcycle crash with injuries at Mount Prospect Rd and Touhy Ave Mount Prospect, Il. Initially police and firefighter/paramedics received a report that a bicyclist was hit by a car and was down unconscious. Then police were updated that a motorcyclist was hit by a car; however that was probably incorrect information. The crash apparently involved the motorcyclist, driving an older model blue Harley Davidson or Indian motorcycle, losing control of the motorcycle with no other vehicle involved. The stretch of curved road is very dusty and dirt-covered with several material yards nearby, a former I-90 construction staging area nearby, and the demolished O’Hare Oasis nearby. Des Plaines police investigated the crash scene for about two hours while the northbound and southbound lanes of Mount Prospect Road were closed between Howard Avenue and Touhy Avenue. 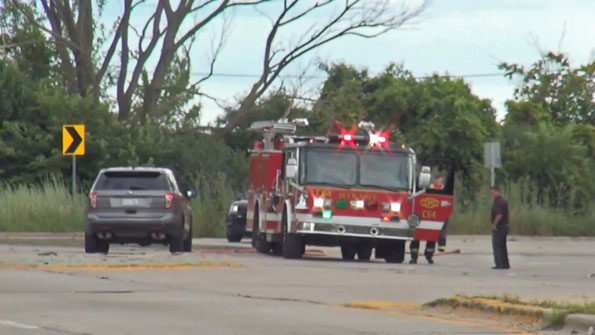 Police on scene were doing CPR by 4:18 p.m.
Engine 62’s crew was next on the scene, reporting the crash was on Mount Prospect Road north of Touhy Avenue.